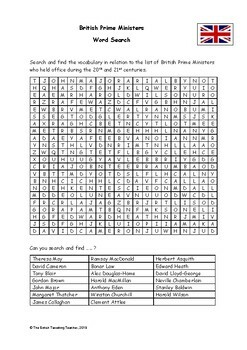 This is a word search which features key vocabulary and terminology around the theme of the British Prime Ministers during the 20th and 21st centuries. Its aim is to raise students' interest and awareness of British political figures in relation to historical events. 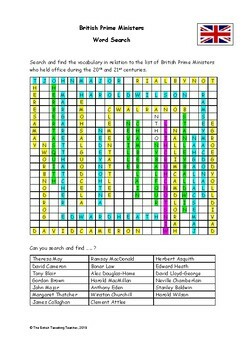 It is suitable for middle school, high school and home school students as an activity to supplement their general knowledge of British politics and leaders.